That’s the problem with debt saturation and why it’s best not to base all your money on debt. It can be demonstrated that the math of debt just doesn’t work in many different ways, today we’re going to take a snapshot at the long end of the yield curve so that we can illuminate the deep, dark, and dank corner in which our politicians and central bankers have painted themselves with their debt backed money. All of these articles point to the same mathematical conundrum of debt backed money. The bond market, otherwise known as the DEBT market, is saying the same thing. 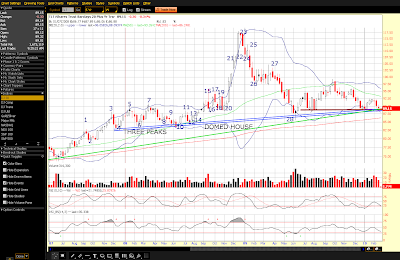 A little over a year ago I wrote Bond Market Hide & Seek – A Domed House & 3 Peaks, that explained the topping formation in long bonds and why I was forecasting that the blow-off parabolic move occurring at the time was ending and that it would collapse back to its base. That’s exactly what happened, and now here we are at the base yet again. This base is an inflection point. A decision must be made. 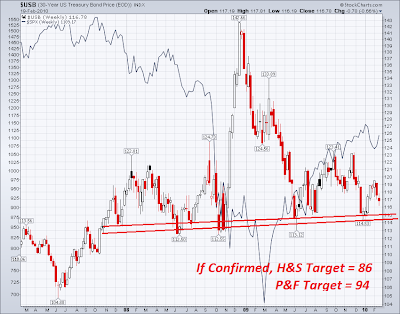 IF that neckline is penetrated and that H&S pattern confirmed, the target on that formation is all the way down at 56! That would represent a disaster of massive debt proportions to our economy. Each uptick in interest rates makes the chasm between debt and income even wider. That 9 month H&S pattern is the right shoulder of the larger H&S pattern. Here you have a neckline that is now at 89 to 90, right in the present position. 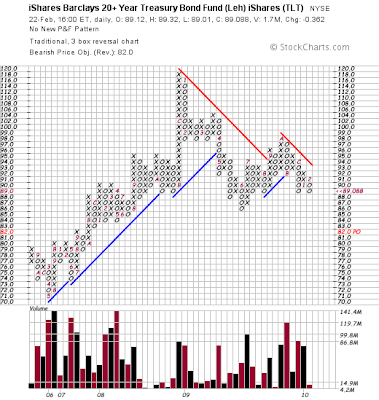 A break below here breaks the long term trendline and validates the smaller H&S pattern that has a price target of 78. That’s well below the larger H&S neckline and now you have a disaster target of only 56 and you basically doubled the cost of carrying long term debt. Could that happen? Absolutely. Many are calling for a bounce upwards, and that may happen, but only if choices are made that allow it to happen. If you look back up at that 9 month TLT chart, I do note that I see 5 distinct waves down into our present location, the daily, weekly, and monthly stochastics are oversold and look prime for a bounce. Definitely up against long term support. 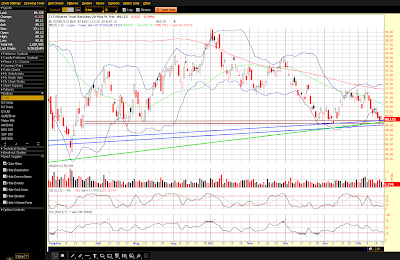 But a bounce here will likely mean that equities take it on the chin. Which is it going to be? The Point & Figure charts say that the necklines are going to break. 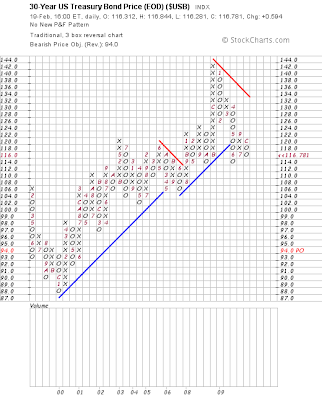 Below is the TLT P&F chart, the bearish target is 82. Door #1. “Well, Bob, behind door number one…” we can let interest rates rise, break the neckline and watch in slow motion as all the holders of debt slowly get killed… that would include our Federal Government. Sure, the stock market can go higher for awhile as money flows out of bonds but eventually the economy simply grinds to a halt as the cost to finance our national debt skyrockets, as the cost to finance homes, autos, and consumer debt skyrockets, and as the expense to finance business skyrockets. It won’t be a pretty sight, but it may take awhile longer to be noticed and fully realized. Bernanke just signaled this is his option by raising rates .25%. This option is the option that kicks the can down the road just a little farther. Door #2. We take the pressure off the debt markets by withdrawing stimulus, letting equities roll over, people again seeking safety into the debt markets. No, bond prices will not, in my opinion, get anywhere near as high as they were before, this is because of debt revulsion – investors have already been burned and now see the massive deficits somewhat as the threat that they are. If we play by the rules of the game, this is the option that will win the day. Of course accounting standards like mark-to-fantasy aren't exactly in accordance with Hoyle already. This option is being jawboned, we'll see if they really mean it and pull support. Door #3. This is the option of changing the rules of the game. A lot of this has occurred already, but this option is a confidence destroyer. It means more Q.E. (money printing), it means more buying up of toxic waste assets, and it means other “creative solutions” could be coming.